the Chinese TV, just popped up on social media, giving us one more glance of the upcoming device. The video is keeping it simple – just some fancy colorful twirls and upbeat music to prepare you for the late October launch. At one point we also see the back panel that has a vertical dual camera setup in the upper left corner, coupled with a flash below. 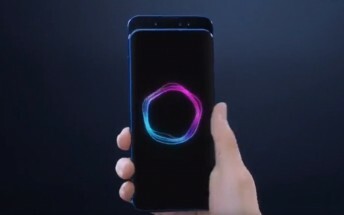 The fingerprint scanner is missing, so we might see it under the screen, meaning the panel has to be OLED.